It is hard to be surprised by the results on the individual side in this one. In fact, heading into the race, we called the top 4 finishers being Victor Mugeche, Oaklee Hauschild, Tom Seitzer, and Peter Campbell and they did not disappoint. Mugeche - as we have alluded to all season - looks unstoppable. After receiving the preseason #2 ranking heading into the season, he has done little else but prove us wrong. He does not appear to be seeing any new faces he has not been able to handle next week and will probably cruise into his second meeting with Ryan Riddle at the state meet. But after his 15:28 on the state course 3 weeks ago, there may not be much left to determine.. After Campbell's 4th place finish was the key to Blue Springs team victory: Morgan Cauveren. The senior's jump to 5th was the big race the Wildcats needed as they were able to hold off Rockhurst by a mere 3 points. 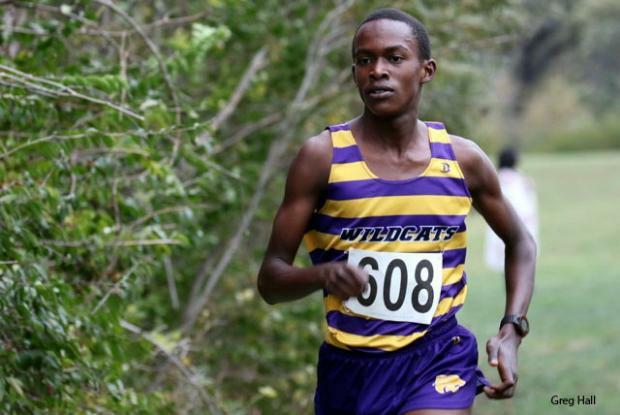 Similar teams across the board, Blue Springs has benefited from big races from Cauveren and Gabe McClain (8th Saturday) in both of their narrow victories over the Hawklets. 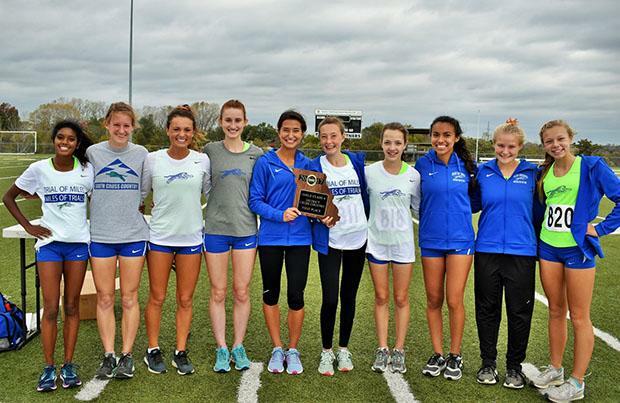 With Liberty moving in for the Sectional meet, this race will be too close to call again as it will come down to which of Blue Springs and Rockhurst's 3-5 step up on the day. The battle between those two teams was far separated from the next 2 teams as Lee's Summit North, led by Matt Reis in 10th and Drew Reis in 11th, took 3rd and Blue Springs South took the 4th qualifying spot with a 6th place finish from senior Zachary Grover. Much like the boys race, the girls race also featured a preseason snub turned unstoppable freak of nature. 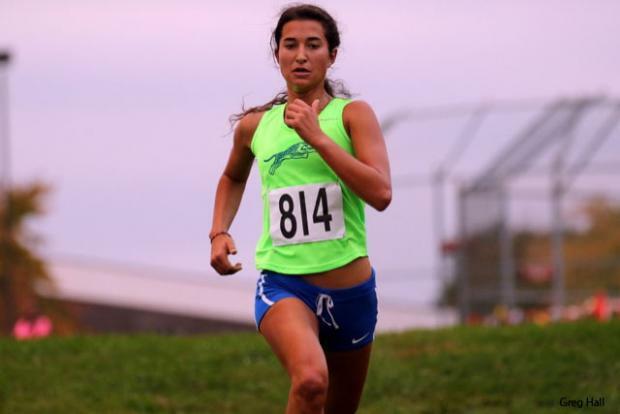 Victoria Findley continued her unbeaten streak on the year, running 18:20 for the easy victory on Saturday. With her teammate Danielle Hotalling coming across in 2nd in 18:57, the Blue Springs South girls were able to secure their fourth straight district title as a team. Ray-Pec (discussed later) may also have 2 under 19:00, but Blue Springs South has 2 under 18:30 and these two show no signs of stopping. They will meet up with three studs in Emma Roth, Madelynn Hill, and Alexandra Hamre this Saturday for what is sure to be a fantastic race and preview of most likely 5 of the top 15 girls at the state meet. Blue Springs did not go down without a fight, though, as the Wildcats, led by Tessa Valdivia's 3rd place finish and Elaina Hubner's 4th place finish put up 47 points and came in a mere 12 points behind South. The cross-town rivals will go toe-to-toe again this Saturday and probably finish 1-2 as well. In 3rd was Lee's Summit North led by breakout sophomore Madelyn Robinson's 5th place finish. Just behind her was Truman's Stacy Briggs, but the real story came from the incredible performance by Grain Valley to take the 4th qualifying spot as a team. The Eagles, left for dead after the injury to Mariah Lister, came together and leaped over Notre Dame de Sion for the final spot to Kearney. Freshman Valerie Holcomb coming across in 8th was the major key to this feat and what's more is that the Eagles will return 3 freshmen scorers and Lister in 2018. The future is looking bright in Grain Valley. The top 30 individuals and top 4 teams in each race will meet up on Saturday with District 8 at Jesse James State Park in Kearney.